A significant contemporary exhibition presented concurrently with the first-ever metalpoint survey at the National Gallery of Art in Washington DC and in conjunction with “Musing Metallic” at The Curator Gallery on 23rd Street, NYC. 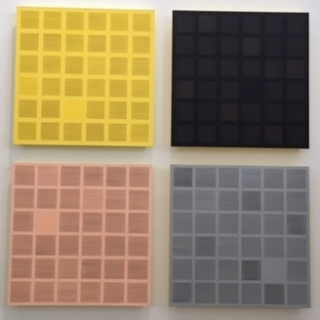 New York, NY (CHELSEA) - Garvey|Simon Art Access is pleased to announce Metalpoint Now!, an exhibition of contemporary artists whose current work features silverpoint and other metalpoint techniques. Opening Reception: Thursday, June 11, 6 - 8 p.m. Expanding on the scope of the history-making metalpoint exhibition at the National Gallery in Washington, DC (Drawing in Silver and Gold: Leonardo to Jasper Johns, May 3 – July 26, 2015), Metalpoint Now! highlights contemporary artists who are using metalpoint in their work today as a regular part of their artistic practice, not as an experimental or occasional variance. Metalpoint Now! is composed of works by eight artists and one artist-collaborative duo. The artists work in a variety of unique and innovative ways; some incorporating a more traditional figurative approach, while others are combining metalpoint with other media to produce striking and unexpected results. Metalpoint is a writing and drawing technique that has been in use since the Middle Ages. Traditionally, a small metal wire is used to make precise marks on a prepared surface or paper. The ‘points’ can be of varied types of metal: from silver to gold, to copper or tin. Silverpoint is the best known and most often used. Metalpoint, which flourished during the High Renaissance until replaced by graphite in the late sixteenth century, traditionally created clearly defined lines and minute details that demonstrated exceptional permanence, being nearly impossible to erase. The initial marks of metal appear grey, but when exposed to air the metals oxidize and tarnish to varying degrees, adding an element of time and chance to the medium. Simultaneously exhibited with Metalpoint Now! are two other group shows that feature some of the same artists’ metalpoint drawings: Musing Metallic, (June 3 – July 11), The Curator Gallery, 520 West 23rd Street, New York, also curated by Elizabeth Garvey; and Drawing in Silver and Gold: Leonardo to Jasper Johns, (May 3 – July 26, 2015), National Gallery of Art, Washington, DC. Garvey|Simon is a contemporary art gallery with a special focus on drawing, works-on-paper, unusual materials and design. Our art advisory service, founded in 1999 by Elizabeth K. Garvey, specializes in American, Modern, and Contemporary Art.